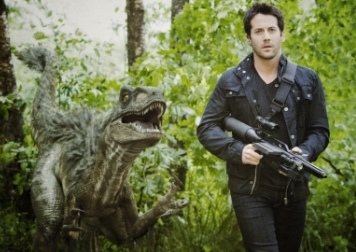 Primeval: New World premieres October 29 on Space | TV, eh? Prehistoric creatures are about to invade Vancouver with the premiere of the highly-anticipated SPACE original series, PRIMEVAL: NEW WORLD. Sinking its teeth into SPACE’s fall lineup beginning Monday, Oct. 29 at 10 p.m. ET, the series stars a flock of genre luminaries, including Niall Matter (EUREKA) and Sara Canning (VAMPIRE DIARIES). The North American spin-off follows a specialized team of animal experts and scientists who discover dinosaurs and other dangerous predators emerging onto the streets of modern-day Vancouver through anomalies in time, and features guest star Andrew Lee Potts as Connor Temple from the original U.K. series. Featuring over 70 visual effects shots in each of the 13 one-hour episodes, the monster of a series will also include 16 land, sea, sky, and sand creatures created by Atmosphere Visual Effects, supervised by Mark Savela (STARGATE UNIVERSE). Leading up to the premiere, fans can fulfill their curiosity about the new series through the official, soon-to-launch, PRIMEVAL: NEW WORLD website featuring an episode guide, cast bios, behind the scenes content, and more. Users can also download high quality visual effects from the series and insert themselves into the dino-action via green screen. A mobile action game is also set to unleash before the premiere, and will take fans inside the series via their IOS devices, as they defend the streets of Vancouver from dinosaur attacks. Users can inhabit a team member and work to capture creatures and rescue civilians. Episodes of PRIMEVAL: NEW WORLD will also be available online at SPACEcast.com following their premiere. In Primeval: New World, while investigating temporal anomalies, a Special Projects Group battles prehistoric creatures. Led by Evan Cross (Matter), an enterprising inventor and visionary hero, the team is comprised of predator attack expert and specialist in animal behaviour Dylan Weir (Canning), security specialist Mac Rendell (Danny Rahim, EAST ENDERS), and physics prodigy Toby Nance (Crystal Lowe, SMALLVILLE). Ange Finch (Miranda Frigon, HEARTLAND), Evan’s oldest friend and business partner, keeps things afloat while Evan and his group track the escapee dinosaurs, with the overeager help of Lieutenant Ken Leeds (Geoff Gustafson, Hot Tub Time Machine), head of the government’s decommissioned department for investigating alien life and other mysteries. On board this season as directors are sci-fi queen Amanda Tapping (SANCTUARY), Andy Mikita (STARGATE UNIVERSE), Martin Wood (SANCTUARY), and Mike Rohl (SMALLVILLE). PRIMEVAL: NEW WORLD is produced by Omnifilm Entertainment Ltd. Executive producers for Omnifilm are Gabriela Schonbach and Michael Chechik. The series is produced and developed in association with Bell Media, German free-to-air broadcaster ProSieben, and UKTV channel Watch, with the participation of the Canadian Media Fund, The Province of British Columbia Film Incentive BC, The Canadian Film & Video Production Tax Credit Program, and British Columbia Film. Entertainment One (eOne) is selling the series in all media as well as format rights, and will be bringing cast members Niall Matter, Danny Rahim and Sara Canning to MIPCOM to promote the worldwide launch of the series. Based on the original series produced by Impossible Pictures, Martin Wood (SANCTUARY, STARGATE: ATLANTIS) and Gillian Horvath (YOUNG BLADES, HIGHLANDER) are executive producers. Judith and Garfield Reeves-Stevens (STAR TREK: ENTERPRISE, SIR ARTHUR CONAN DOYLE’S THE LOST WORLD) are creators. Gillian Horvath, Peter Hume (CHARMED, FLASH GORDON), Jon Cooksey (THE COLLECTOR, THE OUTER LIMITS), Sarah Dodd (FLASHPOINT, ARCTIC AIR), Katherine Collins (ENDGAME), Dennis Heaton (CALL ME FITZ), and Judith and Garfield Reeve-Stevens are writers. Rebecca DiPasquale is Production Executive, Drama, Bell Media. Trish Williams is Director of Drama, Independent Production, Bell Media. Corrie Coe is Senior Vice-President, Independent Production, Bell Media. Catherine MacLeod is Vice-President, Specialty Channels, Bell Media. Rick Brace is President, Specialty Channels and CTV Production. Phil King is President, CTV Programming and Sports.